Add modern elegance to your dining table or kitchen counter with this stylish pair of brushed metal wine racks. 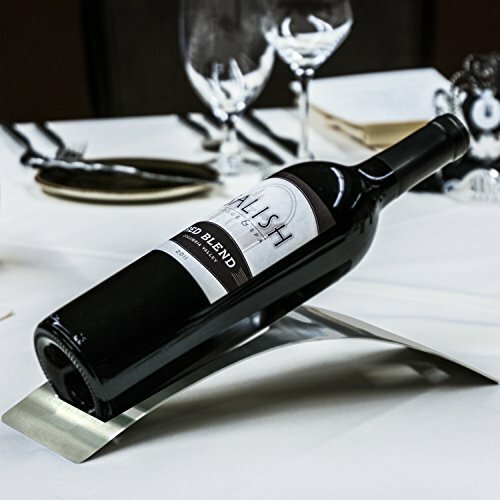 Perfect for displaying and serving your favorite bottle of wine during a meal, this cleverly designed single bottle wine holder is sleek and economical design features a single sheet of curved metal with a cutout that is the perfect size and shape for holding your favorite bottle of wine. Simply set the bottle into the designated space on this contemporary wine rack and watch as the simple, modern elegance of this decorative wine rack brings instant wine connoisseur style to any space. Use this wine rack with a bottle of your favorite wine to create an elegant centerpiece, an eye-catching conversation starter, or convenient storage in your kitchen or dining room. When you use this chic tabletop wine rack to keep your favorite bottle of wine close at hand, you'll have both convenience and style in one beautiful package. You can also give this beautiful wine bottle display rack as a thoughtful gift for a wedding, bridal shower, housewarming, Christmas, or birthday gift. Approximate Dimensions (in inches): 11.75 W X 2.25 H X 4 D.
A very stylish and sleek pair of single bottle wine holders that's perfect for showing off or serving your favorite bottle. An elegant design made of high quality brushed stainless steel.